A tale of love and life, the story is about Arjun (Aravind) who hails from Warangal but living in Hyderabad. He is a gaming design professional and believes in living life to the fullest. On the other hand, there is Vandana (Nikitha), an aspiring fashion designer from Vizag who wants to make a career. 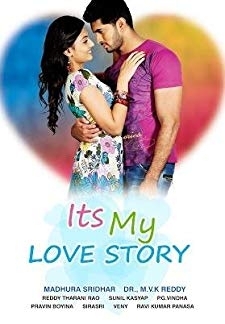 © 2018 Scratchu.com Its My Love Story | Arvind Krishna, Nikitha Narayan, Jayasudha, Sarath Babu, Pragathi, Kasi Viswanath, Vennela Kishore, Ravi Kumar Panasa, Rohit Ranka, Vennela Rama Rao, Sanjay Reddy - Its My Love Story (2011) | Telugu Movie | 5.8/10 | Synopsis : A tale of love and life, the story is about Arjun (Aravind) who hails from Warangal but living in Hyderabad. He is a gaming design professional and believes in living life to the fullest. On the other hand, there is Vandana (Nikitha), an aspiring fashion designer from Vizag who wants to make a career. ... Watch Online!! !